There are numerous questions surrounding shared custody. What is it? How does it work? And how is it different to contact (as visitation is called these days)? In many instances, residence (custody) is granted to the mother, and you, as the father have your contact rights set out. With shared custody, your children split their time between their mother and you. The amount varies – it can be as much as 70% with the mother, for instance – but it means you have much greater contact with them. It presumes, of course, that both the mother and father are fit parents. It’s an idea that has widespread popularity in Europe, and in the U.S. it’s becoming more common, although the UK has lagged behind in adopting it. Shared custody demands a high level of commitment from both parents. If you’re going to have your children for three days a week, then during that time you have you need to make sure your schedule revolves around them. Shared custody, shared residency or shared parenting as it's also known, can offer several distinct advantages, both for parents and children. 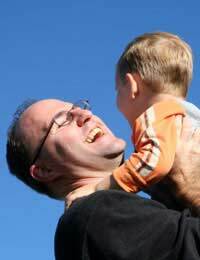 For separated fathers, it means they can be far more involved with their children, seeing them on a regular, extended basis every week. Moreover, it also means that neither parent is carrying the entire burden of parenting while the other is considered absent. With standard Contact Orders, one parent has the majority of responsibility for the day-to-day routine, while the other – usually the separated father – sees the children at the weekend or selected weekdays. Shared custody means your Children Have Two Homes, two stable bases where they can feel secure. Above all, it means they continue to have a real family life with both parents, which makes them feel more loved. Research has determined that when children have experience of shared custody they have better relationships with both parents and are more satisfied with their lives. It’s also shown that even when there’s strong animosity between the parents, shared custody works well for the children. For shared custody to work, you have to live fairly close to you ex, for your children to continue to attend the same schools, see their friends, and so on. This can create social problems for the parents, since proximity means an increased chance of contact with your Ex Partner. Also, if your job or circumstances change and you have to move elsewhere, then the change from shared custody to contact can create emotional problems for your children (the same can apply if your ex has to move for any reason). In other words, by its nature there has to be a certain amount of flexibility in the plan. At present, shared custody/residency is not the norm in Britain, although several organisations are trying to increase its visibility and prominence. The Shared Parenting Information Net and the Equal Parenting Council are both working to make it a very acceptable option here. Just because it's not necessarily the norm, does not mean you can’t bring up the idea in Mediation or through your solicitor as a viable means of custody. In most instances, children are also given a say in where they spend their time, and where they have excellent relationships with both parents, it means they’re not in a position where they have to “choose” between Mum and Dad. Why not have a read through our article on Making Joint Decisions About Your Child's Future for some advice and guidance on how you and your ex partner can make parenting decisions together. My son is 12 this coming August. His mother and I split when he was just 1 1/2 years old. I have parental responsibility and see my son three weekends a month, Saturday morning through to Sunday evening for two of these and Sunday only for a weekend between, then one weekend a month with his mother. In around 10 years i have only had half of one summer holiday. All other holidays the mother does not allow our son to come stay. She takes all holiday periods to herself even with our son begging to spend time with me. For all these years i have paid maintenance and spend extra on suppllying half for school uniforms, shoes and clothes. The mother and I donot meet on the same page ever as I am more concerned that she and her mother are always telling our son he is not allowed to spend any more time with me even though my son is begging. This behavour has made me so ill. For 8 months i have been suffering with severe depression and have not worked. It is affecting my now marriage and our financial stability as i have become so unwell I cannot find the wood through the trees. My ex does not see that my son's mental wellbeing is being destroyed by her not allowing my son to have one of his wishes. He has told me himself, unprovoked, that he has given up even asking his mother as he knows the answer. He is starting to suffer with depression too at 11 years old. I wished i knew how to work this out. His mother is abusive toward me whenever i raise the issue as my son is an emotional wreck when he stays now. I'm being dared to take it back to court by her. She is stating she will put this to rest once and for all and i will see our son less because any judge will see i'm not financially suppotive. Its a joke. Equality in men and women with a child is not there. I had always without fail paid her maintenance until i waas placed on medication due to this mess. HI I separated from my ex-wife in 2014, and was divorced in 2015. I re-married in 2017. We have two daughters, 11 and 13, and we joint parent them. They are with me every Tuesday, and every other weekend (Friday-Sunday) and every other Thursday (When not my weekend). When they're with me they are living with me not staying with me, they have a bedroom, their own things, toys, clothes etc...no different as they do at their Mum's house. We both take responsibility for decisions, and school stuff, like parents evenings etc..Although I obviously don't see them every day anymore, i'm no less involved with them than I was when their Mum and I lived together. I earn a bit more than their Mum, but she gets all the Benefits relating to them and from the settlement has no mortgage to pay (whereas I am now renting). It feels unfair that she can afford to put money aside and go on several holidays a year, whereas we haven't had a holiday in three years, and often struggle just to have enough food and petrol to live on. My question is, given that we are both active parents, both feed and clothe them at our respective homes, why is it that I have to pay maintenance to my ex, leaving me at times so broke that we lack for the basics? Hi I am married lived in same house with wife had two children 5 and 3.Mutual split 8 months ago she moved out to sep house 400 metres away.Share exactly half custody without any lawyers or agreement.We were on a 4 nights three nights split over two weeks.Was not good for the quality time with the children as i always did the Sun Mon tues Wed and alt thursdays she did Alt thurs fri Sat and back to me Sun 0900hrs. All i got was the buisness end of school nursery etc and she got the quality end.She kept alternating changeover days and here and there refused to pay for school activities if it were not her 'day'.Most activities were on my end. I decided then week about and gave her notice of change and agreed to assist taking the children to and from school if it were an issue. She does not want to change as she has helpers take kids to and from school thursday takes Friday off and has quality leisure time. She says if i persist with week about she will refuse me access to children.Can She? I am a single mum and myself and my ex had difficulties within our relationship where I had to leave. We went to court and Cafcass were involved. We came to an agreement of 50/50 shared custody as I don’t want my daughter to blame me or miss out on time with one parent although he was not hands on when we were together. They’ve got a really close relationship since. Unless there’s been neglect or abuse towards the child or the other parent is unfit to care for them there should be no reason within UK law for both parents not to see their child the same amount of time and be allowed to develop their relationship. If both parents are healthy they need both parents and also need grandparents on both sides. More so if both parents could just co parent well without trying to punish the other parent through the child then a child can actually flourish with separated parents working well together. I have a friend going through similar and he’s due to go to court and he’s so worried he may not yet 50/50 even though he’s hands on, lives near their school, has changed working hours since his separation to accommodate being able to have his children. As a female I’m fully aware there is inequality in regards to fathers rights to shared custody and this needs to change. @enquirer33.because( I dont care )mate never did I was repeatedly cheated on why would want that again ? (crying into pillow over that) I don’t think so I be crying into pillow if I was under those conditions again and for my daughter well it’s( mothers job not mine ).So it pretty easy for me .spit the sand mate pull yourself together go on a date or adopt orphan from a third world country or do what did start again it’s better the second time around . @Chris - Not sure how you were able to come over this. Every day I feel as if someone has nailed me to the floor with my hands and legs tied to the floor then took a shovel full of sand and shoved it through my mouth, nose and eyes until I cannot breath but I have to breath it to live. This is seriously how I feel and I feel lonely, suffocated without my son and crying many nights. It has been 6 months and I cannot get over it. @enquirer33.there we be( no court action from myself) .i just want everyone to get on with there (own life’s )and be happy if that means my ex moving permanently overseas we’ll do it .to much (unhappiness with the past) I am just glad it’s the (past and all over now ).so if they think I am like Timmy well( good for them) it’s my life I live the way (I want to live) .so if my x was thinking what my (next move is )well I would like to (tell her )that is going to turn out like (Timmy’s situation) gods truth )lets all (deal with it and move on )and be happy with what we have in our own life’s .peace and god bless look forward to the future without( dwelling and thinking people will judge me )on my choice not to go (legal )it is what is now . (happy days for all) . @enquirer33.i have never been a (hands on dad) .and if my ex wanted to move permanently to another country it’s (ok with me )I haven’t seen my daughter in 10 years so it (really doesn’t matter. )I just want to be left alone I am just thankful I never got myself in trouble with (stupid messages )I had (god my side) with the stuff I said a magistrate would have jailed me .thank my lucky stars. Hi. What is a typical child arrangement for a 2 year old. I used to be a hands on dad caring for him every night and weekends while she takes a break. Currently she decided I only see him 10-6pm sat and 12-6 on Sunday. Cafcass has gone with that recommendation. Seems very unfair. He has medical conditions and we became so close. He was hurt emotionally and psychologically when we separated he was crying after me everytime I drop him and runs to me when I pick him up. He has been taimed with the new arrangement and now loving his mom more. It seems unfair that Cafcass goes with a new status quo created by Mom. It cannot be that dropping my time with my child is ok but building up is not. I live 5 mins away and we have no extended family in the UK so we are the only 2 people he knows and he doesnt go to nursery. I am due to fight this recommendation at court in a final hearing. No welfare concerns and I do not know if I can ask for shared care as Cafcass suggested lives with mom. Mom is doing this so she can take our son to the US permanently and thus reducing child access to me as I refused to do so. Also can anyone recommend a good barrister for this. Hi Thank you for the clear article. I am a separated dad of a wonderful 3 years old daughter. I have her from Saturday 5.30 until Tuesday morning each week. Next September she will start school. Her mum wants me to have my daughter 1 weekend on 2. Means that I will have her 4 days a month! Compare to the time we have to gether now, it is a massive drop! How can a judge decide that? What are the risk that I lose my daughter? I'm really upset by this as I want to be part of her life and not just a babysitter! @billy.i hear what you are saying I went to the solicitor and sat down and had a long talk about my situation. (all I wanted was to meet my daughter )been (10 years) but so they explained to me that it’s not worth going to court now with the time frame.so now I must wait for my daughter to decide when she is a adult if she wants to meet me .my advice now is get to a solicitor( ASAP )if you want to have contact with your child leave it like I did and it’s to late.and (never contact your ex or lose your temper and say stupid stuff)because they will use what you say in court .so now I must wait for my daughter to decide. Hi all, I read a comment on here this morning that made me not feel so alone in my situation as I felt exactly the same way. I have 2 children, I love them dearly, they are my life. I was prepared to have them both and was fully committed to having them. The mother then left and took the kids. Now my ex is restricing the time I have with them and trying to fully control when they see me. It has now got to the point where I am now filing for court because she won't go to mediation. I have asked for shared custody and mentioned it to my solicitors. But why is it that everybody appears to be against the idea? Even my solicitor advised me to consider what I want and what is best! I ask the question why is it better a child spends more time with one parent (usually the mother over the father)? And why can't a child be cared for by both parents? I have not yet heard a valid answer. I hope the law will change soon as many fathers and children are suffering an injustice. Hi All. My ex is about to move 1hr and a half away from me. I initially moved closer to her residence and even got a job next to her house to enable me be part of my sons lives. I want to be able to go to parents evenings and help them with their education and out of school activities. I will not be able to do this for much longer as she has found love and has told me she will be moving as she knows whats best for them. I know i am limited with rights to stop her. But I am desperate to put a stop to this. It feels heart breaking that I have no say in both my son's lives/ Is there anything I can do legally to influence a happy medium?. I have been with my partner for 4 years... She had 2 daughters when we met and there dad wasn't around so i took them on as my own i even got there name changed by depoll so they felt part of a real family she then fell pregnant with our son. I no longer want to be in this relationship as i just don't trust her and as we all know with no trust a relationship can't work, I'll do what ever i have to do to see my kids but i want shared custody as they are my kids as wel not just hers i have always provided for her and my children but i really don't want to be in this relationship anymore but don't want her stopping me seeing my kids because she wants to get back at me for finally walking away. Just want to know what steps to take to give me the best chance of making sure she don't stop me seeing my babies. Hi guys, I’ve been looking everywhere for the answer to this question I about to put forth but have had no such look finding it. Around a year ago my and my partner split up, she left or home and left me with a two bedroom flat to run by myself, her reason for this was a) she has somewhere else to go to b) she wanted a stable place for me to have where I can have my daughter every weekend Saturday - Monday or Friday - Monday depending on what the mothers needs are for that week.i work part time to accommodate the time I spend with my daughter every weekend but only recieve a deducted rate of housing benefit as in there eyes I’m only entitled to a one bedroom flat and therefor reduce my housing benefit due to the bedroom tax, is this right?! Surely having my daughter EVERY weekend since the split up, 3 or 4 days a week should effect this and I should get more help with the cost of rent and council tax? Hi, Can it be arranged/agreed to have one house where the child/children live all the time and the mum and dad move in/out every week depending how much time is agreed to spend with the child/children? Hi I have a question my nephew has a daughter to a skank that was sleeping with my husband for years and others .now we are a family oriented family to she come along her behaviour is disgraceful the stories and the men in our family coming forward and admitting that they where with her my stupid husband thought she loved him ha ha to the others come out in our family said no she loved them ha ha now I no my nephews daughter does not need to grow up like that .we are planning to take the child away from the mother we have real concerns for the welfare of my nephews daughter and the upbringing she would have had .we are planning not for shared care but full time care of my nephews daughter she needs to live with her daddy . Hi , im currently going for shared residency of my 2 yo son. His mother and i were married at the time of his birth. I am his father. My ex is refusing to allow me to see my son and has cut co tact. Long story short shes done herself no favors and even the authorities have said she will look pretty bad in court. Im hoping to gain over night contact. There are no safeguard issues etc. My issue is, we live about 80 miles apart. I left her the marital home and everything in it to be able to keep my son in a stable home. I live with my parents. Im About to move in with my gf and her 2 toddlers, its an hour and half drive min. Now, if i get overnight i can only co.mit to monday and tuesdays. My job is long hours and every weekend. Head chef. 14 to 16 hr days. If i get overnight, needless to say my son will be with myself my partner and her 2 kids in our home 80 miles away,i dont know what happens to schooling. He turns 3 next march. He will.attend nursery 3 hours a day. Which 3 hours i dont know my ex wont even tell me which nursery he will be going to or where his day care is etc or even his shoes size.... Can nursery be split between 2? The way itl play is i could pick my son up at 3.15pm on the monday but id need to drop him back off for 12.15 the next day..... or pick him up at 12.00pm and drop him back at nursery at 9.15am the next day....neither is even 24 hour hours with him. What do people do in these cases.. i could drop him on day 2 at 9.15 and wait 3 hours somewhere and hope i dont get wet or cold but its not ideal. Any suggestions??? Lj.i am sorry to hear this .sounds like you bred with deadbeat .i am sorry hun but if he doesn't want anything to do with the child there is nothing you can do about it and to throw a spanner in the works hun if is not earning well you are going to get zero money .so you better get use to doing everything yourself .ps i am victim myself i fell for this tall dark and handsome prince got me pregnant he went to 'shop'to buy baby milk he never come back and do you no what the kicker was he run off with my aunty on my mother side and got married in thailand now they are living over there and my aunty is selling coconuts on the beach why he surfs i get no support .